WHAT RIGHTS DO WE HAVE , AND WHERE DO THEY COME FROM ? WHAT RIGHTS DO WE HAVE ? When most of us think of “rights,” we imagine the things we are free to do, like make our own decisions, practice our religion, speak our minds, travel without limitations, or engage in the free exchange of goods and services. We assume that nobody can stop us from doing these things. When we study history, however, we realize that many people in the past, and a great many around the world even today, lack the freedom to exercise many of the rights that we take for granted. Where do these rights come from? Through most of human history, people have been living under the rule of feudalistic monarchs, kings, oligarchs, emperors–with little freedom and very few rights. The first recognition of rights came with the signing of the Magna Carta in 1215 when King John of England was forced to sign a document guaranteeing a set of basic legal rights and liberties. But it was a very limited charter and applied mostly to the Church and the Barons. The next milestone in the development of rights came in 1647, when a group of English political activists, called the ‘Levellers’, produced “An Agreement of the People”, which set forth a collection of principles in matters of religious freedom, and freedom from conscription, and asked that laws apply equally to everyone. We hold these truths to be self-evident: that all men are created equal; that they are endowed by their creator with certain unalienable rights; that among these are life, liberty and the pursuit of happiness; that to secure these rights, governments are instituted among men, deriving their just powers from the consent of the governed; that whenever any form of government becomes destructive to these ends, it is the right of the people to alter or to abolish it. And, for the first time in human history, a document was drawn detailing an individual Bill of Rights. By proclaiming that all men are born equal, it was clearly implied that everyone had equal rights and that these rights were available to all irrespective of caste, creed, status, race, etc. This was the beginning of the movement to greater human freedom and eventually to many of the rights that citizens of the free world enjoy today. The pioneers of India’s freedom drafted the Constitution of India under similar circumstances of being denied liberty and basic human rights by the ruling British Crown. It is therefore not a coincidence that the Constitutions of both India and the United States start with the words “ We the people”. What Rights do we have? What rights do “ we the people ” have? Can these rights be taken away? What is the role of a government in protecting these rights? All our rights stem from the most basic of all human rights that “Every man has a property in his own person.” In other words, I and I alone have a right over myself, my body, my thoughts, my actions, my speech, my decisions. I am free to do whatever I want with my body as long as I do not use it to harm others or infringe upon their rights. This proposition of self-ownership then logically extends to the right to ownership of the production that comes from the work I do as a person using the skills endowed to me by my creator. In other words, we are all entitled to enjoy the fruits of our labor and any form of unfair and coercive taxation is a violation of our basic rights. And from this emanates the right to personal property and the right to freely exchange the fruits of my labor for property. The word property is not limited to land or physical property but to include anything that people can use, control or dispose of. This right to property also includes the right I establish by temporary (and legal) occupancy of something. So, for example, if I were sitting in a chair at the airport, that chair, while not my permanent property, temporarily belongs to me while I occupy it, and no one can ask me to leave it ( unless forced to by someone in authority for emergency or security reasons). Similarly, if I am in a queue, I have the right to be served in the order in which I am standing–that position in the queue becomes my property. Anyone jumping the queue would be violating my rights. The concept of rights is further extended to the right to practice religion, the right to free speech, the right to exchange the fruits of our labor with that of another, the right to congregate, to vote etc. Then there are legal rights which include the right to defend ourselves in a court of law, the right to a fair trial, the right to legal counsel etc. Today, however, we are flooded with rights from both the left and the right: there are welfare rights, women’s rights, nonsmokers’ rights, the right to life, abortion rights, gay rights, animal rights, right to education, right to information, you name it. It is virtually impossible to separate rights from interests, preferences, and the claims of different groups. And therein lies the problem because interests and preferences will conflict and create political and social conflict. In the libertarian view, therefore, we have an infinite number of rights contained in one natural right. That one fundamental human right is the right to live your life as you choose so long as you don’t infringe on the equal rights of others. So while many of the so-called rights may not be available to everyone everywhere the right to life, liberty, and the pursuit of happiness is that one basic right that can be enjoyed by people anywhere under most circumstances. Besides defining our natural rights, the Declaration of Independence was also very clear in stating that these rights are not gifts from a government, a king, or a monarch. These rights are imprescriptible, meaning, they are not granted by another human but are natural and cannot be taken away. Whether they come from God or Nature is not essential; the important thing is that our rights are not granted to us by the government. Instead, it is “ we the people” that choose to form a government to protect the rights we already have. So even though we are born with these rights, some protection is required so we would have the freedom to exercise those rights. And so it is to protect our rights and allow us the freedom to exercise these rights that “ we the people” choose to form a government. The way to secure our inalienable rights is to, therefore, consent to giving up a small amount of our freedom so that a government could be formed that has the authority and finances to protect our rights. 3) To provide common goods that benefit all and to collect revenues to pay for these public goods. Obviously a lot is encompassed in this role: managing and training an army to protect the citizens from external aggression; protecting people from physical assault or bodily harm, theft, embezzlement, fraud etc. by financing and training a police force; constituting a system of laws that protects people from harm, both physical and economic; providing a fair and unbiased judicial system that adjudicates differences that occur between people over rights, property and contracts; developing a stable monetary system to permit exchange and facilitate savings, investment and commerce; having a clear set of laws to protect property rights including intellectual property; providing a fair but tough criminal justice system which provides for habeas corpus; and establishing consumer protection laws that protect consumers from being duped. The government also has the exclusive authority to marshal resources to provide public goods–goods that are consumed by the society as a whole and that are financed with public funds. So if a highway needs to be built it requires the acquisition of land which can only be done by using the authority of the government. Sometimes the public good benefits only a small section of the people but is still funded from general funds–like a road connecting two rural areas in Panjab will likely never benefit the taxpayer who lives in Mumbai, yet part of his taxes are used to pay for the road. It is for this purpose –to marshal resources without misusing authority, to make wise decisions that benefit the highest number of citizens, and to protect our lives and rights that it is necessary that a government is chosen that is faithful to sound principles. We need leaders who are wise enough to avoid mindless wars and destructive economic restrictions, and strong enough to enforce law and order. Leaders who deserve authority not because they are born to powerful families but who rise to the top by demonstrating their abilities and goodness–people who earn the authority to lead in government based on their “virtue and talents”(Thomas Jefferson). So while the government has an important role to play in maintaining social stability and economic freedom, this role is limited. The government in India, however, is anything but limited. It is involved in far too many things—from running banks, insurance companies to railways, coal mines, transport, power, energy, cement plants, telecommunications, fertilizers, chemicals etc.. It regulates the registration of companies with extensive and mind-numbing regulations of incorporation, it regulates intrastate commerce and international trade with thousands of complicated regulations, and it complicates exchange with over 53 different taxes and thousands of pages of tax rules. It is no wonder then that India is now ranked 143rd in the world economic freedom index behind countries like Pakistan, Bhutan, Nepal, Sri Lanka, and Bangladesh. The government whose role it is to promote institutions that facilitate economic freedom has enslaved the creative and entrepreneurial spirit of its people with suffocating rules and regulations and a substantial involvement in both social and economic activities. How do we fix the system? “We the people” have to decide what we want the role of the government to be: Do we want the government to be narrowly limited to performing the essential tasks of protecting each individual’s right to his life, liberty, and property, or do we want the government to be “rulers” dictating how we should behave and then to attempt to modify, influence, and change our behavior. 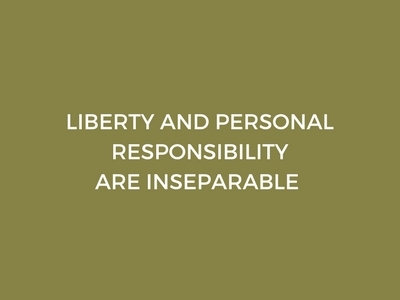 If we decide on a limited role for the government then we are agreeing to assign to it the role of an observer, an impartial umpire, or the head of a family whose role is to protect the family, balance resources with needs, act as adjudicator to resolve disputes, establish rules of behavior for the family members to ensure peace, harmony and protection of individual rights, and represent the interests of the family with outsiders. This would require each family member to exhibit greater self-responsibility and be able to manage all their relationships based on mutual consent, trust, voluntary exchange, and respect for the rights of others. We would also have to be ready for a system where everyone is equal and it does not matter who is harmed and by whom; rich or poor, politician or citizen, VIP or commoner, man or woman, Hindu or Muslim, Brahmin or Dalit: Justice will be equal for all. Each individual gives purpose and moral compass to his own life based on his faith and as long as he does not violate the rights of others he is sovereign over his own affairs. He may choose and act wisely or absurdly, but it is his life to live as he pleases. In the second case, the government is an active player in social and economic affairs, using its power of coercion to determine how people live, work, and associate with each other; a government machinery that tries to assure certain outcomes or influence social behavior with rules by imposing, for example, prohibition on alcohol use or a sin tax on cigarettes ; a government that affects economic behavior by deciding which industries to tax and which to benefit with subsidies; a government that shapes economic transactions through incentives, price and wage controls; and a government that controls freedom of speech through overreaching anti-nationalist and sedition laws. “ We the people ” also have to decide whether we want more freedom and liberty or we want to be subjected to the authority and dictates of a bureaucratic government. The government’s power comes at the expense of people’s freedom so the more power a government has the less freedom “ we the people” will have. For freedom and liberty to flourish government must shrink. Indian’s have a choice to make: either we submit to big government, find a way to pay for it and put up with its coercive excesses, or, move towards a smaller less intrusive government and give up many government programs. You can’t have both. You can’t have freedom, liberty, free markets, fewer regulations, less red tape, and also be dependent on the government to take care of everything in our lives. The price of big government is a society that depends on the state to solve all its problems. But then what you get is a society that lacks self-responsibility and discipline, and the inability to take the risks necessary in today’s innovation-driven world. And history shows us that a society that lacks discipline and self-responsibility never makes a prosperous nation. Unfortunately, over the years, Indians have become too dependent on the government and this has shifted responsibility from the self to the government. It is hard for most Indians to imagine a political structure with a limited role for the government. Surely, they would argue, that in this messy and dangerous world the government would have to play a larger role. The answer is an unequivocal NO. The only way India will become a great and prosperous nation is with a limited government and a people with an internalized sense of duty, morality, fairness, self-responsibility, and respect for the rights of others. DOES INDIA’S SHAME-BASED CULTURE ENCOURAGE WRONDOING?